Last week I finished the required drainage and stormwater handling of the new workshop. 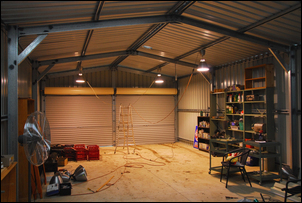 With the council inspection completed, it was time to move on to equipping the new workshop with adequate light. During construction of the workshop, the 14 x 6 metre roof was equipped with two translucent panels. These panels are the same size and shape as the normal roofing sheets, so their installation is straightforward. 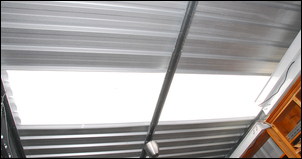 In most weather conditions, each panel provides a very large amount of light. So why only two panels? In sunny south-east Queensland (apparently we have 300 days of sunshine a year!) I was concerned that using more panels would cause the workshop to get hot. A smaller shed that I previously had in South Australia was at times uncomfortably hot when standing beneath either of the two translucent panels. So in this larger workshop I figured that using (say) four panels would be too many – they’d provide lots of light but also plenty of heat. The two translucent panels were positioned on the northern aspect of the roof and towards the end of the shed in which the machine tools and workbench will be located. These are at the opposite end of the workshop to the twin roller doors, so with the roller doors up, on overcast days the natural light through the shed can be fairly even. However, on sunny days the natural illumination is skewed much more to the ‘work’ end of the shed. One of the most important aspects in a workshop is to have good artificial lighting. 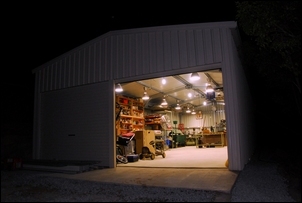 A workshop with good lighting can be used at night or in overcast conditions with little decrease in effectiveness. That might seem obvious, but I’d suggest that the majority of workshops are way under-illuminated – the lighting level apparently set for normal visibility rather than precision work. Different types of artificial lighting have different characteristics. But before they can be described, you need to know what those characteristics are. Luminous intensity is measured in Candela (cd). Luminous intensity is used to describe the amount of light emitted in selected directions from lamps and fittings. Luminous flux is measured in lumens, abbreviated to ‘lm’. Just as there is an electrical power input measured in watts, there is a “light power” output measured in lumens. The reason that “light power” is not measured in watts is because the response of the eye to different colours needs to be taken into account. To obtain a measure of the luminous flux of a light, the radiant flux (measured in watts) is weighted by the frequency response curve of the eye. Thus, a high power output light at a wavelength to which the eye is less sensitive results in a lower luminous flux value. Conversely, if the light emits a great deal of radiation at 555nm (where the eye is most sensitive), its lumen rating will be high. Luminous flux measurements are widely used in lighting. A typical application is in expressing luminous efficacy. This is a measurement of how much light output there is for a given electrical power input. It is expressed in lumens/watt, abbreviated to lm/W. Illuminance is measured in lux, abbreviated to lx. Illuminance is a measurement of how many lumens there are per square metre. There are recommended values of maintained illuminance for various activities, with the table below showing some International Commission on Illumination (CIE) suggestions. 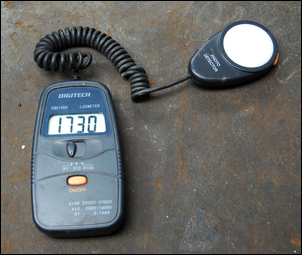 Normal handheld light meters measure in lux. On a flat surface where there are few reflections, illuminance can be easily plotted using lines of equal illuminance. These lines are called isolux contours. Basically, it is a diagram of the “pool of light” found beneath outside street lights - the one so beloved of writers of detective fiction! Such a diagram is useful when designing the lighting system of a car park, or in working out the spacing of lights to provide even illumination in a large building. An object at any temperature will emit radiation. At low temperatures the wavelengths of the radiation are mostly in the infra-red region and so cannot be seen. However, if the temperature is increased, the object (for example, a piece of steel) will start to glow. It is then emitting radiation that can be seen. The temperature of the object can be measured in Kelvin (K), which is its temperature in degrees Celsius plus 273.15. The radiation properties of a hypothetical so-called black body radiator mean that at 1000K it will be red, at near 3000K it will be yellow, at near 5000K white, blue-ish white near 10,000K and pale blue near 30,000K. This means that the colour of a light source can be specified in terms of its colour temperature - the colour that a blackbody radiator would be if heated to the specified temperature. Electric lights have widely varying colour temperatures, but because your eyes are very tolerant of differing colour temperatures, the perceived colour of different light sources varies relatively little. Daylight has a colour temperature of about 5500K, while an incandescent light bulb is around 2800K. Fluorescent tubes are available with colour temperatures from 2900-6500K. Colour rendering refers to the appearance of an object when it is illuminated by the light source under consideration. Light sources of similar colour temperature can have completely different wavelength compositions and so can provide great differences in colour rendering. A low pressure sodium lamp produces light at just a single wavelength and so the lamp reveals only that colour. An incandescent lamp has an output that covers all wavelengths fairly evenly - although there is an emphasis on red. A high pressure mercury vapour lamp has a mixture of some ‘lines’ (high outputs at specific wavelengths) mixed with a continuous background spectrum and a band of energy at the red end. Of these light sources, the incandescent lamp gives the best colour rendering, followed by the high pressure mercury lamp and then the low pressure sodium lamp. Colour rendering is measured on a colour rendering index (expressed as Ra) scale of 1-100, where 100 provides the best colour rendering. The Ra scale for a lamp is based on the illuminated appearance of fourteen different colour chips. The colour rendering of incandescent lights is very good at 99Ra, while fluorescent lights vary from 85-90Ra. When assessing how items will look under different lighting, colour rendering is much more important than colour temperature. Let’s start off with efficacy – how many lumens/watt are produced. Remember, this figure takes into account the sensitivity of the eye to different wavelengths, so it’s a ‘real world’ figure. This is the key figure when assessing electrical running costs – higher efficacy equals brighter lights for the same power cost. * The above values for discharge lamps do not include the effect of the ballasts that must be used with those lamps. Taking ballast losses into account reduces total efficacies typically by 10-20%, depending upon the type of ballast used. From this list a few points can be immediately made. Except for machine-specific illumination (eg a work light on a lathe), incandescent (conventional light bulbs) and halogen incandescent (eg 12V MR16) lights are out. That leaves fluorescent, mercury, metal halide and high pressure sodium. But what are the colour rendering properties of these light sources? Low pressure sodium (not shown in the above table) has very poor colour rendering – the reason people look so weird under yellow sodium street lights. High pressure sodium is better than low pressure sodium. Metal halide and fluorescent lights have a colour rendering index that varies, depending on the bulb in question, from accurate (Ra 90 -100) to moderate (Ra 60 – 80). The most widely available of these light sources is fluorescent. 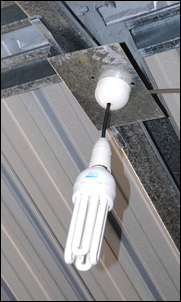 Able to be bought in both compact types (the ballast and starter are built in) and conventional linear types (long tubes that are inserted in a fitting that contains the ballast and starter), fluorescent lights and fittings can be easily sourced. Fluorescent sounds good, but in the case of my 14 x 6 metre workshop, I figured something like 14 double battens would be needed – perhaps $500 for the cheapest new fittings, and $750 for ‘brand name’ lights and fittings. Sometimes fluorescent battens come up secondhand, but usually in twos and threes – not fourteen fittings of the same type. I was also a little unconvinced as to how bright the resulting lighting system would be. But what about compact fluorescent lights? These are now available in up to 48 watt ratings, this wattage claimed to be equivalent of a 240W incandescent light. With a price of about $27 each, at the (guessed) requirement for about six lights, that would be only about $175, including the standard bayonet sockets. Hmmm. 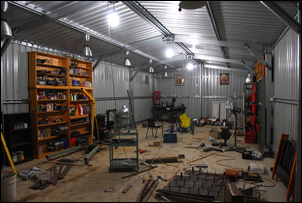 Finally, discharge lights like sodium and metal halide are easy to find secondhand – people seem worried by the complexity and tend to get rid of them without asking for a lot of money. This means it’s not at all hard to acquire these lights – in fact, I had previously bought 15 of them for just $30! Here’s where the theory hits the reality – and it starts to get really interesting. When assessing any lighting system, you must use a lux meter. That might seem like an extravagance, but these digital meters are now available very cheaply on eBay (AUD$25 including postage). A lux meter shows quickly and easily the actual illuminance that is occurring. When assessing the evenness and intensity of illumination, it is vastly better than using your eyes alone. My first test was with a high power compact fluorescent. A 48W unit was purchased and hung in the workshop at an appropriate height. Directly under it, the light meter recorded a disappointing 72 lux. A large metal reflector was then placed around the light. At the position at which the reflector could be easily mounted (ie the bayonet socket screwed to it), the reading rose to 180 lux. However, even this peak reading was a lot less than my desired 500 lux. The next test was of one of the 15 second-hand high intensity discharge lights that I’d bought as a job lot. Using a clear 150W metal halide bulb and the standard reflector, the measured illuminance beneath the light was an excellent 650 lux. But here’s where it gets difficult. Of the 15 high intensity discharge secondhand lights I had bought, only two proved to have these metal halide bulbs. The others had what I assume to be high pressure sodium (the control gear says it can handle 100 – 150W high pressure sodium and 70 – 150W metal halide) and these lights proved to be much dimmer – in fact, a measured reading of only about 250 lux. Even with three of the lights temporarily suspended, the overall illumination was disappointing. OK, time to take a step back. To get the illumination I wanted (at least 500 lux throughout the workshop) I’d need the equivalent of twelve 150W metal halide bulbs mounted in the high discharge light fittings I’d bought secondhand. That required an expenditure of around $600 for the bulbs. Having all the high power lights switched on would take about 2.8kW – a load the equivalent to just under three one-bar electric radiators. But how often would I need the full 14 metre x 6 metre workshop so brightly illuminated? Not very often. If I switched them in two groups of six, I could selectively operate these lights. For example, when working down the end of the workshop with the bench and machine tools, I could have six of the high power lights running. If I do panel work on a car, I could have the six lights at the other end of the workshop running. OK, so viewing these lights as special ‘working’ lights reduces the effective running costs because they would normally be used six at a time. But if you take this approach, you then need some other lights to provide general illumination! These other lights are also useful in that high pressure discharge lights (like metal halide) take a while to reach full brilliance, and if there’s a momentary power cut, they will not re-light until they cool. Without the other lights, you could be left in the darkness. OK, so what could I use as this ‘low power’ lighting? I did some more testing, comparing the 48W compact fluorescent against some double (36W x 2) traditional fluoro light fittings I’d picked up secondhand. Certainly, this comparison was unfair in that the secondhand tubes may have been pretty old, but the 48W compact fluoro had a far better output than the double tube fitting. And not only was the intensity better underneath, the compact fluoro also had much better coverage. 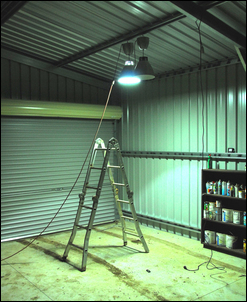 So running three 48W compact fluoros would give adequate lighting for normal shed use – eg moving a car into the shed, collecting something from storage, etc. Furthermore, the total load of these lights would be only about 150W, so this lighting would be very economical to run. That was the theory – but how well would they work? I temporarily powered the three 48W compact fluoros from extension cords and mounted them in place. The results were fine. OK, let’s take a look at what did and didn’t work. 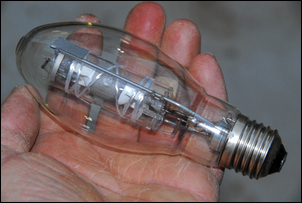 The secondhand high pressure discharge lights, complete with reflectors, were inadequate when equipped with high pressure sodium bulbs, providing an illumination of 250 lux. Considering their high power consumption, these lights were also of little use. The 48W compact fluorescent didn’t produce enough light to be the main, powerful lighting source – too many of them would have been needed. (At an educated guess – about 24!) However, three would provide adequate low power illumination – and at very low running costs. Finally, the secondhand high pressure discharge lights with reflectors and 150W metal halide globes provide excellent illumination. With a spacing and mounting height both of about 3 metres, the illuminance looked like it could exceed 500 lux – and with better colour rendering than achieved by the high pressure sodium. The use of a switch panel with three switches would allow simultaneous switching of the three compact fluorescent lights, and the metal halide lights in two groups of six. At the last minute I decided to add another(!) light to the mix. This is placed on the outside front of the shed and aimed down and forward. Where I live there are no streetlights and so if you’re loading a car out the front when it is dark, it has always been a bit problematic seeing what you are doing. 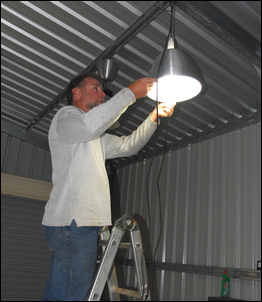 The metal halide lights are an old-fashioned design where the control gear is mounted in aluminium housing, with the light socket and reflector suspended beneath. A short length of cable terminated in a three-pin plug connects to the control gear. The first step was shorten the cable between the control gear and the light socket – this was about five times too long for the application! Note: this cable carries much higher than mains voltage so appropriate cable must be used – you can’t replace it with normal power cable. After the cable was shortened, the lights could be hung. I used a short section of chain pop-riveted across the ‘top hat’ section purlin, with the chain connected to the in-built hook of the light by a ‘joining’ chain link. A box of 20 non-switched power outlets was bought (eBay - $40). These used click-in bases and the bases were pop-riveted to the purlins. In the pic a base is arrowed. For best results, the compact fluorescent light had to hang about 15cm down from the rafters. 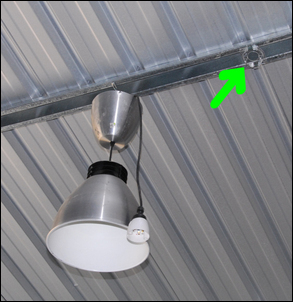 This was achieved by mounting a ‘ceiling rose’ fitting on a folded sheet metal bracket that was bolted to the rafters. A short length of cable from the ceiling rose to a bayonet light socket fitting allowed the bulb to be mounted at the correct height. Because only three were needed (ie three ceiling roses, three bayonet sockets and three 48W compact fluorescents), these were all purchased at a hardware store at fairly exorbitant prices – about $110 for the lot. So that’s the lighting fittings all up and ready to go. Now, what about an electrician? In addition to wiring the lights, the electrician was also required to install a workshop switchboard complete with circuit breakers and RCD (safety switch) devices, wire-in 13 power points, and run the cable from the house switchboard. All the lights and power points were already mounted. Obtaining adequate illumination in the workshop proved to be much harder than it first appeared. However, using a light meter and conducting some simple tests soon showed what would and would not work. The final system provides both adequate low-running-cost illumination and also excellent high intensity illumination for when work is being carried out.